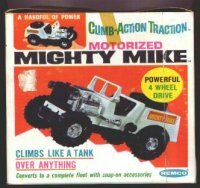 Remco's Mighty Mike truck from 1966 was the Captain Action of toy vehicles. Dump Truck or even a Wrecker. dangerously (sometimes even on two wheels) across the 8-9 feet of roller coaster-style track. easily be able to pick up a nice Mike or one of the sets for under $35.